This definitive account of the Chicano movement in 1960s Denver reveals the intolerance and brutality that inspired and accompanied the urban Chicano organization known as the Crusade for Justice. Ernesto Vigil, an expert in the discourse of radical movements of this time, joined the Crusade as a young draft resistor where he met Rodolfo “Corky” Gonzales, the founder of the CFJ. Vigil follows the movement chronologically from Gonzales’s early attempts to fight discrimination as a participant in local democratic politics to his radical stance as an organizer outside mainstream politics. Vigil, Ernesto B. 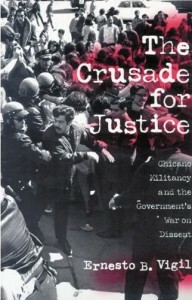 The Crusade for Justice: Chicano Militancy and the Government’s War on Dissent. U of Wisconsin P, 1999.